Cyclone Ofa pounded Western Samoa for three days in the weekend causing indescribable devastation, homelessness and many people to break down and cry bitter tears of frustration and despair. Every village, every family has become a victim of the storm’s savage siege of destruction which started Thursday night and built up in momentum until it unleashed its most devastating onslaught Sunday evening till Monday morning. A final count on the storm’s victims could not be ascertained. But the latest reports said seven have died, ten were injured and were now in the Apia National Hospital, and one was rescued from drowning by the Police. Although extensive damage has been done to all villages in Upolu, reports from Savaii said the damage done there was far more serious. “Houses were flattened everywhere and the scene is of total destruction,” a visitor who was in Savaii during the hurricane said. Overseas communication was lost during the storm’s peak period when the Post Office lowered its satellite disc at Afiamalu so that it could not be destroyed by the 100 knots winds. Later when the winds abated, the disc was mounted and communication with overseas resumed. “That was brilliant thinking on the Post Office’s part,” people were saying. • Water supply system damaged. Two young men are reported to have drowned at Solosolo when a pickup truck carrying them was hit by a wave and smashed against the rock wall. 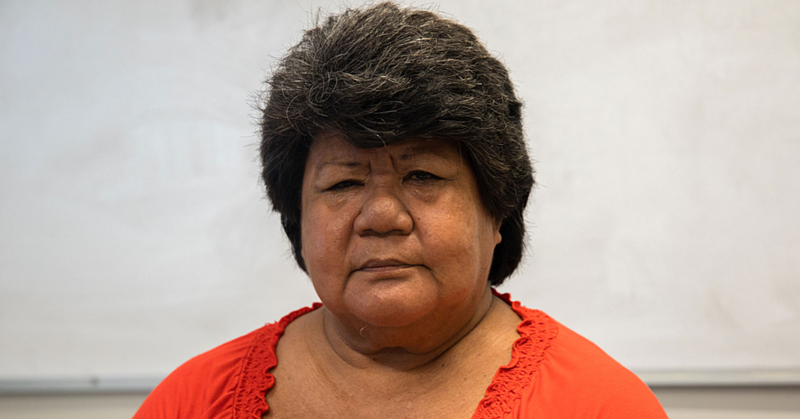 A couple, a man and woman, who travelled with them, arrived at Apia National Hospital two days later because they were taken around the other side of the island since the closer way was without a road. Those who helped take them to the hospital had to cut their way through falling trees which kept blocking the road. Early this week fears were held for a ship which had sent out a distress signal from about 80 nautical miles south-east of American Samoa. The Nikki Lou’s distress call was picked up by an amateur radio operator in the Cook Islands, who passed the information on the Australia. Savaii’s main hospital is among the buildings severely damaged. Faleolo Airport was closed after the loss of communications equipment, but was opened for the first flight from New Zealand on Tuesday. A state of emergency was declared on Sunday. With 70 per cent of Western Samoa’s vital coastal roads badly damaged and large vessels grounded communications are difficult. 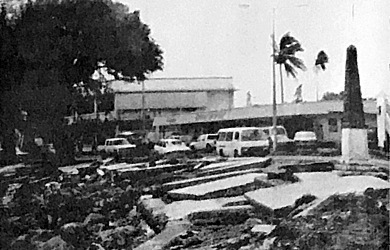 Although the storm was comparable to the 1966 hurricane which claimed dozens of lives in Western and American Samoa, the difference was that in 1966 the storm lasted only a few hours while this one went on for three days. Radio 2AP was broadcasting from a make shift position near its Afiamalu transmitter after the loss of its seafront studio to huge waves. The Meteorological Services Offices were also swamped so that they were evacuated. Gusts of up to 140 knots had blown through. Many people had to be evacuated from beach front homes. Twenty foot waves crashed ashore. Cyclone Ofa later swept through Niue after it left here early in the week reportedly causing extensive damage in that island country.